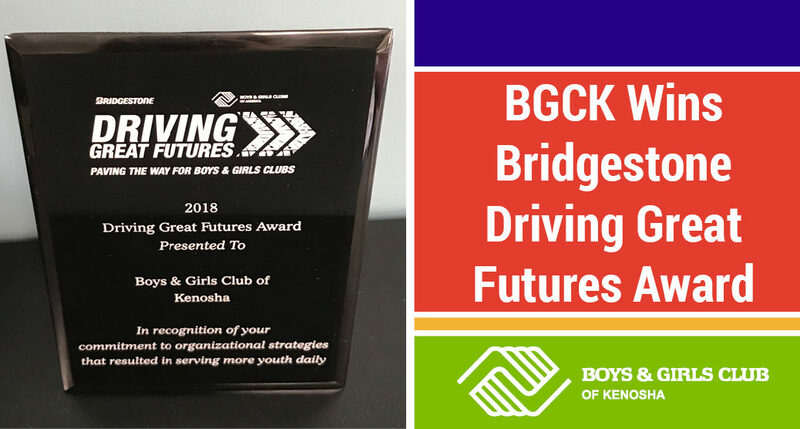 Kenosha, WI – October 24, 2018 – The Boys & Girls Club of Kenosha received the Driving Great Futures Award sponsored by Bridgestone Retail Operations at the BGCA Midwest Leadership Conference held in Indianapolis earlier this month. This award recognizes clubs with significant increases in average daily attendance, while also focusing on growth in local partnerships, and improving program quality. From 2016 to 2017, the BGCK’s average daily attendance increased by about 25%, from 285 kids per day to 350 kids per day. Gus the Bus free transportation has led to huge increases in both the youth and teen centers after school. The youth center alone went from serving about 60 kids per day to sometimes as high as 180 kids per day, over the past two years. Additionally, the Club is now serving almost 70 kids per day at the Laken Family Jefferson Elementary Extension in partnership with Kenosha County. The Club hopes to open additional school sites in future years.